Finding an Information Technology (IT) internship opportunity in the Boston area can be done using various resources. You can either go to career fairs, network or even search online using various job boards. Finding an IT internship requires a game plan and you need to strategize every step, to find your perfect internship opportunity. In the what section, you can put “help desk intern, technical support intern, IT intern”, use common position titles that employers would usually use. In the where section, you can put the location of where you want to work. For example, Boston was inputted because we are from Boston. Once you click on Find Jobs, you can then see a bunch of listings. 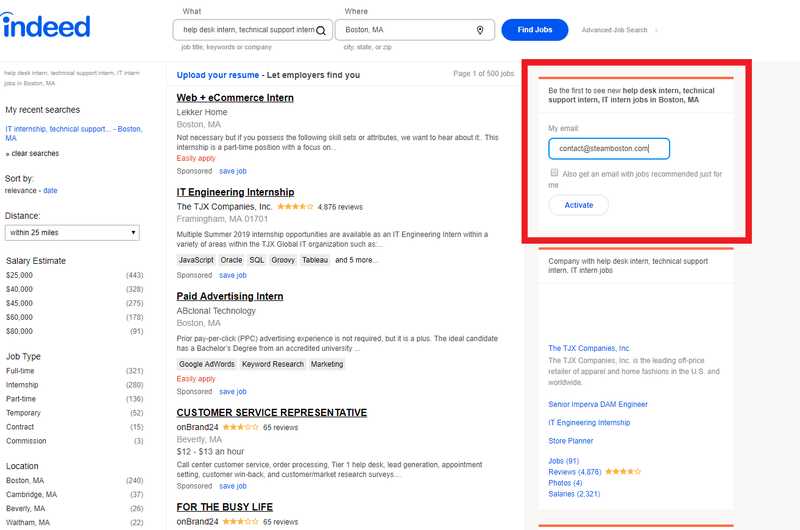 It is important to stay on top of your game when you are job searching, so setting up email notifications will keep you aware of IT internship opportunities that are in the area. On the right-hand side, you can see a column saying, “Be the first to see new help desk intern, etc”. You can put your email address and click on activate. Once you click on active, you will now get notifications to send to your email about the latest job opportunities. Writing down a list of 10 companies you want to work for is important because it helps you narrow down your job search. It gives you an opportunity to figure out what industries you want to work in. The 10 companies you write down is going to change, but this is going to help you find out which company matches your criteria. Once you have the 10 companies locked down in your list, you can visit the websites of the companies and do your research. Looking at the job boards on those websites is also important because some of those job postings do not get listed on websites like indeed.com. Once you have companies in mind you want to work for, you can search for career fairs in the area that those companies are attending. Meeting up with a recruiter at a career fair will increase your chances and it is not a bad idea to drop your resume too. Performing a search on LinkedIn and seeing if you have any mutual connections working at companies you are interested in is not a bad idea too. Stopping by at your school’s career services office and talking to a career counselor would help if you are confused in the job searching process. Connecting with alumni from your college would be a great way of obtaining valuable knowledge about the job searching process in general and you would never know that alumni would hook you up with an opportunity. Next articleWhy You Should Take Advantage of Your College Career Office? Why You Should Take Advantage of Your College Career Office?